Twitter, too, is full of stories. It may be a cacophony of voices, but you can still easily “follow” someone through the establishment of their problem, rising tension, conflict, climax and resolution. And the trends like “first draft movie lines” can also be narrative entertainment: they’re like the movie scene where someone starts singing and little by little everyone, even that unlikely thug in the corner, eventually joins in. Story in chunks – A single author builds the story post by post. He or she may already have a manuscript, but it gets chunked out a 140 or fewer characters at a time. Author Nick Belardes has used this approach in his two Twitter novels Small Places and Bumble Square. Single post, single story – The ultra compressed novel. An example is novelsin3lines by Félix Fénéon. This is akin to the first draft movie lines that Ms. Schmelling refers to. Collaborative story seeds -A starting post, followed by a sequence of Twitter posts contributed by followers. This process creates a story like one of those school science projects where you grow a crystal in a liquid. One example is BBC Audiobooks America Twitter novel project. Here is how it works. 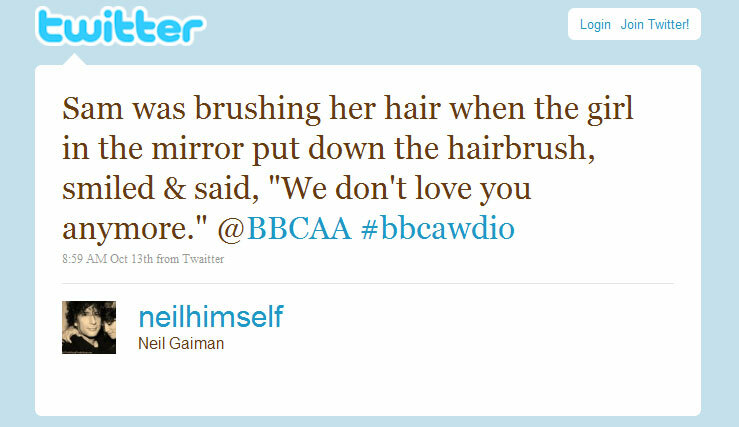 Author Neil Gaiman kicked off the novel with the post: Sam was brushing her hair when the girl in the mirror put down the hairbrush, smiled & said, “We don’t love you anymore.” Thousands of people have responded with the next possible sentences. 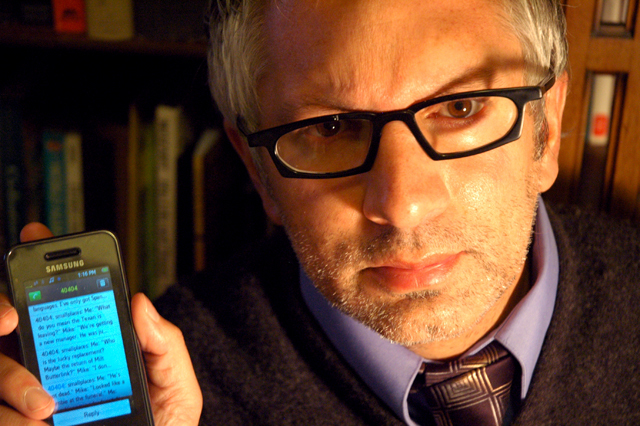 The selected tweets are chosen by BBC Audiobooks and the final result will be posted on iTunes as a free podcast. For more examples, check out the Read Write Web which posted a nice list of Twitter novels in progress. Inspired? Brandon Mendelson, who has written the Twitter novel The Falcon Can Hear the Falconer, has posted some good advice for wannabe Twitter novelists on TwiTips. Key among his pointers is to maintain a separate site to provide the story’s updates from where it began and link to this site from the Twitter novel site. This entry was posted in author tools, blog to book, open publishing, publishing strategy, readership strategies and tagged BBC Audio, Neil Gaiman, Nick Belardes, twitter, Twitter novel. Bookmark the permalink. I don’t know if others have also tried this, but I wrote a 51 chapter novel on twitter, with each chapter being the 140 characters (with a couple of exceptions). I reposted on the above website and added chapter titles and Intro. I’m working on “A History of the World by Train” if anyone wants to check it out.